How much will Intel charge for the 9000-series Core? Are custom RTX cards irrelevant? and how to tell when a deal is really a deal. 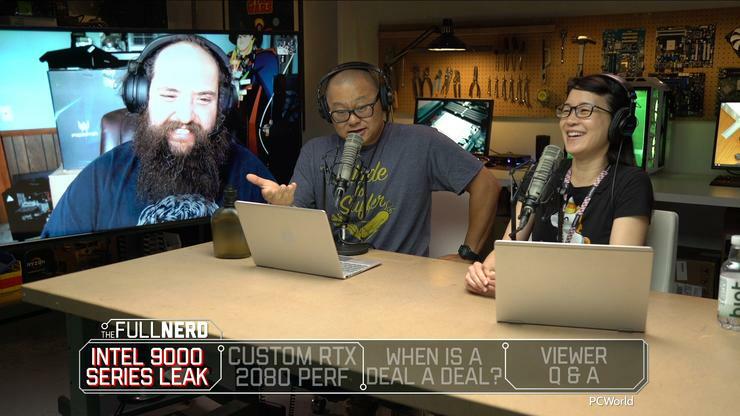 In this episode of the Full Nerd, Gordon Mah Ung, Brad Chacos, Alaina Yee, and Adam Patrick Murray discuss the latest leak of Intel's upcoming 9000-series Core chips, and how Nvidia's RTX cards throat-punched the competition. Finally, did Gordon get a good deal, or was he just a sucker? You can witness it all in the video embedded above. You can also watch The Full Nerd episode 69 on YouTube (toss us a follow while you’re there), or listen to us on Soundcloud if you prefer just audio. Have a PC- or gaming-related question? Email thefullnerd@pcworld.com and we’ll try to answer it in the next episode. Be sure to follow PCWorld on Facebook, YouTube, Twitch, and Twitter to watch future episodes live and pick our brains in real time!